Dimensions: 8 5/8" x 10 7/8"
Dimensions: 6.25" x 7.5" x 7.25"
Dimensions: 9 1/4" x 9 1/2"
Dimensions: 6-3/4" x 8" x 8"
Dimensions: 6.5" x 6.25" x 5.375"
Cream Bust, Necklace Jewelry Displays, 5"
Dimensions: 5" x 4.125" x 7.5"
Dimensions: 7.5" x 6.5" x 9"
Cream Bust, Necklace Jewelry Displays, 6"
Dimensions: 6.375" x 4.5" x 10"
Cream Bust, Necklace Jewelry Displays, 7"
Dimensions: 7.5" x 5.125" x 11"
Burlap / Lace, Jewelry Necklace Display, 6.5" x 2.5" x 8"
Cream Bust, Necklace Jewelry Displays, 4"
Dimensions: 4" x 3.25" x 6.25"
Dimensions: 8" x 3-1/4" x 11-3/4"
Dimensions: 9-1/2" x 3-1/4" x 11"
Dimensions: 8" x 3-1/4" x 9-1/2"
Tall Necklace Display, Black Velvet, 6.5" x 9" x 16-5/8"
Dimensions: 6.5" x 9" x 16-5/8"
Tall Necklace Display, Linen 6.5" x 9" x 16-5/8"
Tall Necklace Display, Faux White Leather, 6.5" x 9" x 16-5/8"
We have a variety of necklace display colors from cream, black, or white. Cream and white necklace display is better fitted for jewelry with a darker color and opposite for black necklace display. Choosing the right color for your necklace display will help express how the jewelry will look on an individual and enhance the jewelry itself. 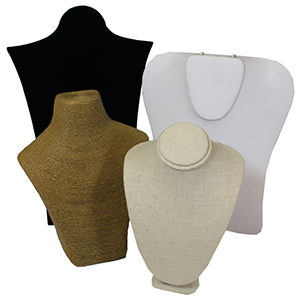 American Retail Supply has necklace displays in variations of materials: leather, linen, velvet, and burlap. Choosing one over the other is only a preference as a jeweler. After choosing color and material, it comes down to the shape of the necklace display. American Retail Supply has different neckforms to fit single or multiple necklace on one display. Some necklace display has bust or padded. Instead of neck forms, there are slotted to display necklaces in rows. American Retail supply has been supplying Jewelry displays to business for years. Call 800-4260-5708 if you have any questions.